There is a great deal of understandable concern about the effects of parental separation and divorce on children. Research has consistently identified that parental psychological problems such as depression, anxiety, and substance misuse can increase the risk of harm to children, but there is a lot of confusion about it. Clarity about this serious concern has recently been provided by a recent Social Policy Report by the Society for Research on Child Development (SRCD), titled Supporting Parents: How Six Decades of Parenting Research Can Inform Policy and Best Practice. That report identified individual and couples’ psychological distress as the main proximal barriers (in contrast to distal barriers such as general economic conditions that negatively affect families) to good parenting quality. Part of the confusion about the impact of parental psychological dysfunction is due to the fact that, when parents are going through the divorce process (including separation for never-married parents), many experience a hike in emotional distress. In legal circles, tongue-in-cheek comments are frequently heard about the “divorce diet,” which represents the frequently decreased appetite and loss of weight that can accompany depression or anxiety. In many cases, the increased emotional distress is temporary, and it fades out as parents make adjustments in their social lives and regarding how they think about the ending of the romantic relationship. However, a significant proportion of parents experience psychological problems that are more intense and long-lasting than the temporary adjustment reaction described above. These more serious psychological problems can get ignored because so many parents experience transient emotional distress, and there are often mistaken assumptions by professionals that such difficulties must just be the temporary type. 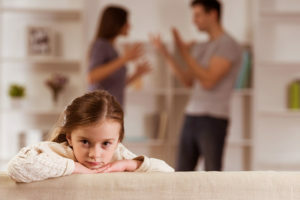 For example, there are many parents who experience significant psychological difficulties that have been present since well before the separation or divorce process started. These individuals may even experience an intensification of their disorders due to the stresses of divorce. Also, there are parents whose depression or anxiety starts around the time of the divorce process, but it continues long-term, long after the divorce process has ended. Many of these parents with enduring psychological problems experience ongoing stresses associated with life changes, such as not finding another satisfactory romantic relationship, financial hardships, and/or persistent serious trouble in their relationships with their children. A substantial proportion of parents experience significant psychological problems. The SRCD report describes that about 17 percent of parents have experienced a major depressive disorder, and about 27 percent of mothers of teens have experienced an anxiety disorder. There is an important overlap between parental psychological dysfunction and marital conflict. Interparental conflict can often worsen individual parental distress and vice versa. Researchers have identified a number of pathways by which parental psychological distress can lead to child and adolescent emotional and behavioral problems. These pathways include increased exposure to open marital conflict, which has clearly been identified as a risk factor for children of divorce. Also, the negative impact on youth adjustment can be a result of negative emotional expressions by parents and kids being insecure about the relationship between their parents. These multiple causal pathways have been a focus of research only fairly recently, and it is reasonable to expect that the scientific knowledge base will expand. It is very likely that there are also a number of other ways that parental psychological difficulties negatively influence children. For example, a depressed parent with low energy may manifest elements of withdrawal from children, including decreased supportiveness and/or limit setting. There may be decreased motivation and frustration tolerance, irritability, increased substance use, and possibly harsh parenting practices. So, what can professionals who are involved with children and families do? A crucial first step is to recognize that there are uncertainties, complications, and few easy answers. Psychologist and Nobel laureate Daniel Kahneman has been a leader for decades in studying judgment under conditions of uncertainty. His work has focused on a distinction between intuition (which is fast, emotional, and effortless) and reasoning (which tends to be relatively slow, emotionally neutral, and effortful). The use of reasoning can frequently increase the accuracy of our assessments, and thereby contribute to steps that are likely to help children and families. Kahneman has identified a cognitive process, WYSIATI, which is an acronym for What You See Is All There Is. It is a type of intuition that involves jumping to conclusions on the basis of limited evidence, and it combines the acceptance of what appears to be a coherent story with an internal sense of cognitive ease that makes it so easy to accept. Therefore, when faced with possibly significant parental psychological dysfunction and the risk of it having a negative impact on children, it is crucial for professionals to take a careful, deliberative approach to assessing each individual and family. It is essential not to jump to conclusions and assume that parental distress is just a temporary matter without substantial impact on children. Similarly, it is important not to jump to conclusions and assume that parental distress is representative of a serious disorder and that the children being harmed by it. There are many parents who suffer from depression or anxiety and who nonetheless cope well enough to maintain good relationships with their children. The required careful, deliberative methods with such cases involve collecting adequate information, typically from multiple sources. It requires working to thoroughly identify evidence that supports and is contrary to the hypothesis that a parent has a significant psychological problem. Furthermore, it involves carefully identifying evidence that supports and contradicts the idea that the possible parental psychological distress has a negative impact on children or has a substantial risk of such a damaging effect. More detailed information on this topic can be found in my forthcoming book, Parenting Plans, scheduled to be published by the American Bar Association in spring, 2018. Mark Cummings et al., Parental Depressive Symptoms and Adolescent Adjustment: A Prospective Test of an Explanatory Model for the Role of Marital Conflict. 42 J. ABNORMAL CHILD PSYCHOLOGY 1153 (2014). Zalewski, M., et al. (2017). “Clinical Considerations When Treating Adults Who Are Parents.” Clinical Psychology: Science and Practice: n/a-n/a. When providing mental health services to adults, we are often treating individuals who, among their other roles, are also parents. The goal of this article was to provide practitioners with the state of the science about both the impact of parental psychopathology on children and the role that children’s well-being has in parental psychopathology. We discuss the benefits of integrated care for adult clients who are parents, as well as the barriers to providing integrated care for both parents and children in psychotherapy, and provide recommendations for practice. With this information, practitioners will gain greater awareness of their opportunities to treat adults in their parenting roles as well as to contribute to prevention of mental disorders in children.